The struggle between German U-Boats (submarines) and Allied convoys was the core of the battle of the Atlantic. U-Boats sought to destroy Allied merchant vessels and warships, while Allied convoys sought to transport food, supplies, weapons, and personnel across the Atlantic. 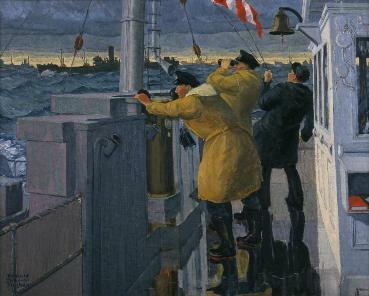 Donald Mackay's painting depicts the crowded open bridge of the Canadian corvette HMCS Galt, which spent much of the war escorting convoys of merchant ships. Crew members perform a variety of duties, while a number of the convoy's merchant ships are visible in the background. Drawing on First World War experience, Allied nations established convoys following the outbreak of war in September 1939. Allied navies sought to protect them from attack by enemy forces, particularly German submarines (U-Boats), by gathering merchant ships into groups and escorting them with warships like Galt.